Bee Sting products usually come with a hefty price tag – we’re talking hundreds of pounds – and they are known to be a favourite among Royals (Kate Middleton is famously a fan of the Bee Sting facial) and A-Listers alike. The venom is said to work wonders on wrinkles (or preventing them in the first place) as scientists have found that the sting produces collagen which increases skins elasticity. Thankfully for those of us without a regal budget, Nip + Fab have bought us a more purse-friendly way of bringing Bee Venom into our daily routine. Their Bee Sting Kit costs just £34.45 and includes the four key products; the Bee Sting Fix Lifting Mask, Eye Cream, Deluxe Cream (moisturiser) and also a Bee Sting Fix Body Souffle. I’ll start with the only negative that I have – I’m not a big fan of the packaging, I find the yellow a bit garish and as shallow as it is, i’ll be keeping it in the drawer rather than on my dressing table, but it sure does stand out and the silver accents give it a bit more of a luxurious look. There’s plenty of products in each of the containers, so you are getting great value for your money. The first product that I tried was the Bee Sting Lifting Mask – the product promises plumping and lifting effects and although I’m yet to get any wrinkles, a girl can never be (bee?!) to prepared! The mask formula is a gel, which you apply to a cleansed face for 10 minutes. Immediately after application I could feel a light tingling effect, I love to feel a product working and find this weirdly satisfying! My non-existent wrinkles can’t comment on how well the lifting effect works, but my skin felt taut but not in an uncomfortable way. The Bee Sting Fix eye cream also gives the slightest tingling effect which feels like it awakens the skin around my eye area. It is a very rich formula and reduces the look of tiredness. I’ve been applying it daily in the morning and find that I have a reduced need for under eye concealer, but any products which I do apply stay put longer that if I had applied directly to the skin. The Deluxe Face Cream is a nourishing moisturiser which I find almost too rich as a day cream but it works perfectly as a night cream. It is absorbed quickly and leaves my skin feeling fully hydrated. When I wake up I don’t notice pillow lines on my face so much and skin looks brighter even before I apply my day moisturiser. My favourite product of all though has to be the Bee Sting Deluxe Body Souffle. It is a super rich formula and after using for over a week each morning, my skin feels noticeably more soft and smooth thanks to the Shea butter and Honey within it. It’s a pleasure to use – the scent is fresh with a slight honey tint and the fragrance lasts throughout the day. It’s a very thick formula but sinks in quickly and, like the other products in the range, gives a slight tingle upon application. Again I can’t comment on the elasticity effects it has had on my skin, only to say that my skin feels better and dry patches such as on my elbows are much improved. 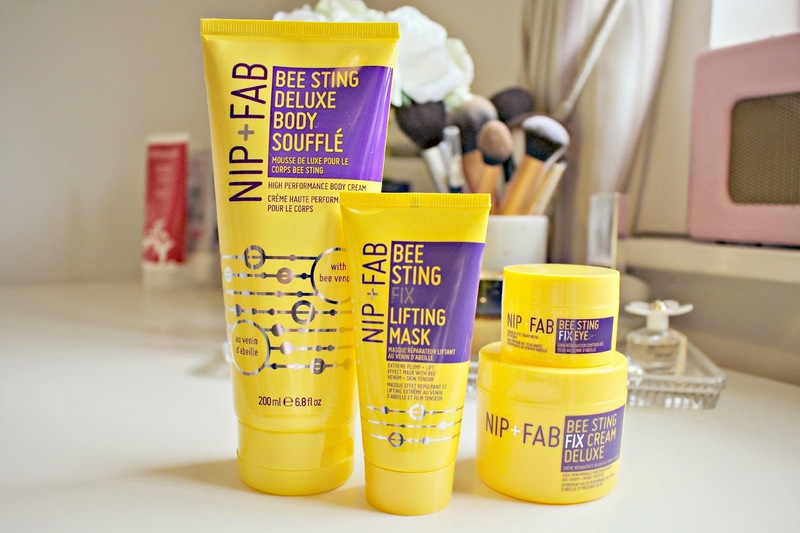 Overall, i’m pretty obsessed with this new range and can’t wait to try some other products from Nip + Fab! They are available from loads of places including Debenhams (Where the fixing mask for some crazy reason has £10 off right now?! ), ASOS, Boots etc. 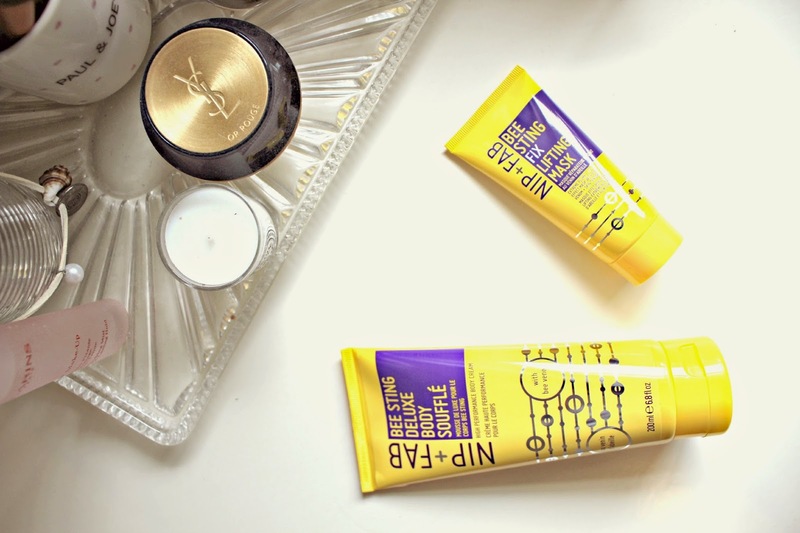 Have you tried anything from the new Nip + Fab range?